Our time in the islands was great and there are many memories to share, so I’m splitting them up. First Part…the stops on Isla Espiratu Santo. We spent the final week of November until the middle of December up in the national park islands of Espiratu Santo, Partida and San Francisco. Joined with friends on s/v Navigo and s/v Estrellita, we had day after day of exploring and admiring the beauty of these remote and uninhabited islands – definitely three weeks we will never forget. Besides them just being awesome people, we really enjoyed sailing alongside Navigo and Estrellita because we all challenged each other to sail as much as possible. Pretty much every time we moved to new spots we sailed. Sailing off the anchor and into anchorages was something we really enjoyed instead of hearing the drone of the motor. And it was fun to see if Camanoe could keep up with these “faster” boats. She did well and Dave was very happy with our old girl. Camanoe at sail heading to (possibly) Candelero. 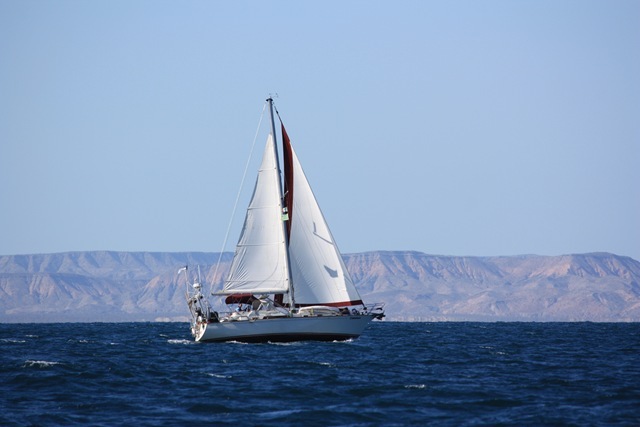 Picture courtesy of s/v Estrellita. 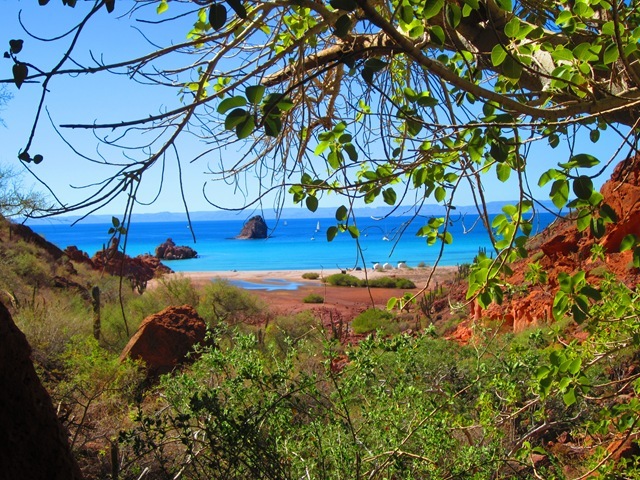 First stop after La Paz was Ensenada del Candelero in the northern part of Isla Espiratu Santo. We originally thought we’d just hop over to San Gabriel, which is the first anchorage after La Paz, but the winds that day were pushing us North and why waste a good sail when we could hit up San Gabriel on our way back down the islands. 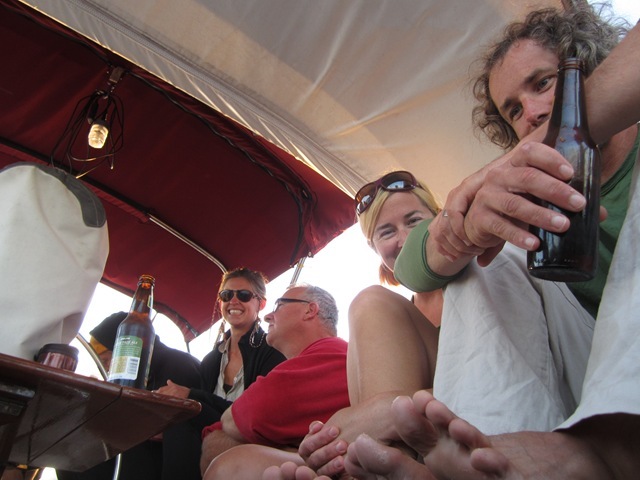 We had a fun BYOB happy hour on Estrellita that first evening where we got a chance to meet Aaron and Nicole from s/v Bella Star and catch up with our friends from s/v Panache. 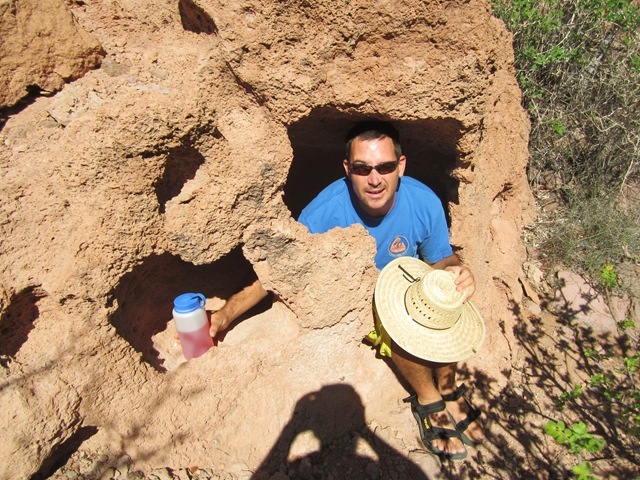 The next day we all ventured out for a hike and had a great time climbing over and through all the rock formations. View of the Ensenada del Candelero anchorage from our hike (L), Zach, Marilee and Nate from s/v Panache monkeying around (center), and the Capt’ hanging out in his Flintstones house (R). We were in Candelero for Dave’s 33rd birthday on December 3rd. We had a birthday happy hour with the usual suspects as well as John and Lisa from s/v Orcinius who were also on the Ha-Ha with us and happened to pull into Candelero just as I announced on the radio that we were hosting a happy hour. More the merrier! We had a lemon cake that I baked as well as some yummy brownies courtesy of Camelia on Navigo. She also brought over some balloons and a lovely birthday sign and badge for Dave to wear. We had a very festive evening! 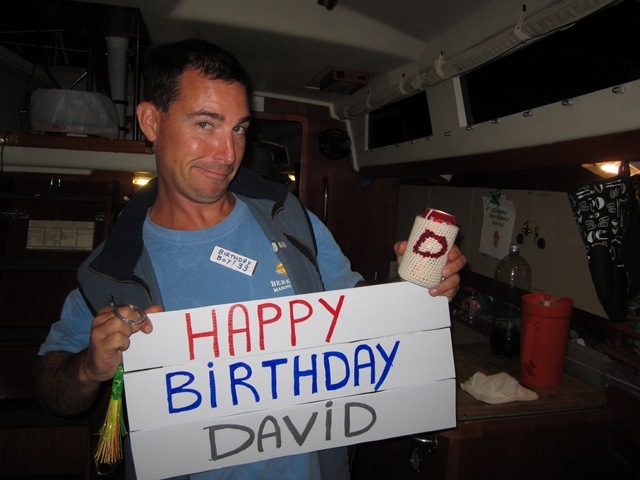 Lucky bday boy received a handmade beer coozy from Estrellita and a fishing lure from Navigo. Pic below of his loot. Capt with his birthday goodies (L), and a FULL cockpit on Camanoe for the birthday fun (R). We did stop back through San Gabriel anchorage in the southern part of Espiratu Santo on our way back down towards La Paz around the middle of December. San Gabriel has a beautiful beach where you can wade out for what seems like forever. 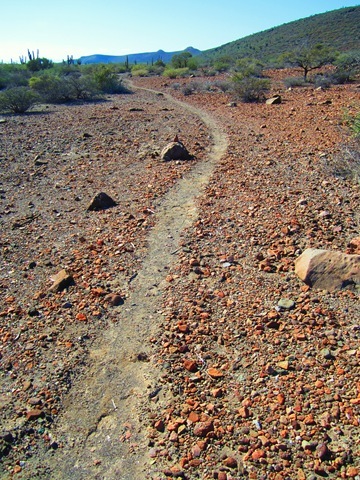 Dave and I decided to explore the trail (which we never really found until we were on our way back) between San Gabriel and Puerto Bonanza on the other side of the island. It was a good 2 1/2 mile walk each direction through lots of prickly brush. We were very glad to see the other anchorage at the end of the walk, but unfortunately it was too chilly to swim and too windy on that side of the island to truly enjoy the beach. 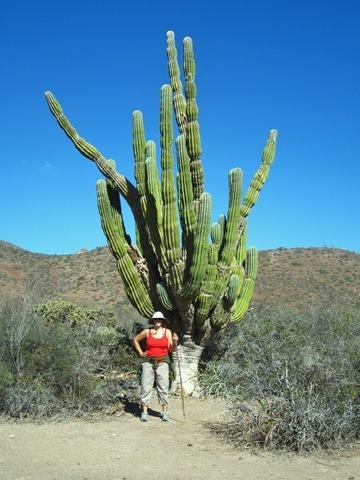 We did get some awesome shots of the huge cactus throughout the trail though. Steph vs. the huge cactus (L), and the easily marked trail that we didn’t discover until on our way BACK (R). The funny part of the day was that super low tide set in while we were off on our hike/walk and our poor dinghy was left a good fifty yards or so away from the water. I don’t know why I didn’t take a picture of this, but it was quite a feat dragging the dinghy through the sand after our five mile walk. I’m sure we gave the other boats in the anchorage a good laugh as they watched us walk halfway back to our boat before we could actually get into the dinghy and float back home.